“The town of Renick was once called “Falling Spring” for the streams that issue from the hills nearby and flow into the Greenbrier River.” – West Virginia Writers’ Project. Renick was settled by William Renick and Captain Robert McClanahan in 1769. When the train still ran, it was a major agricultural trading center. In the early 1900s Renick was home to one of the first creameries in the area. Here they processed milk for the local farms even in the hardest of times, when there was no bridge and they had to ferry the milk across the Greenbrier River on a boat. In 2011 and 2012, the Traveling 219 project conducted several interviews in Renick and produced audio stories and pieces about the culture and history of the town. 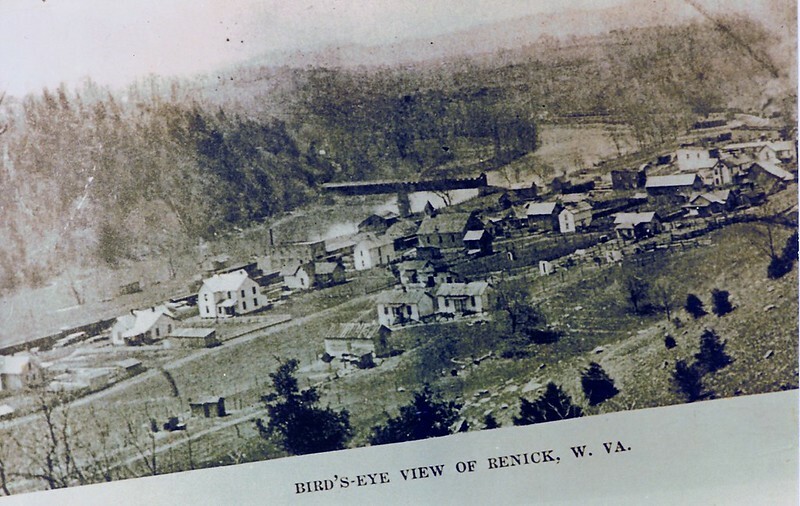 “Bird’s eye view of Renick, W. Va.” ca. early 1900s? From the Collection of Tina Horan. Photo of US 219 in Renick taken courtesy of Joey Walls. As you enter the town of Renick, driving north, take a right turn down Auto road. Just after the post office and before the school. You will come around one curve. Stop. Before you cross the river. Stop. This is old Downtown Renick. Look to your right. Along the river where the Greenbrier River Trail now runs, is where The Renick Creamery once stood. 10 m. Historic Lewisburg, full of unique shops and dining, including Bella’s Corner Gourmet Store. For information on traveling to Greenbrier County, contact the Greenbrier County Convention and Visitor’s Bureau (1-800-833-2068).